For nine long months (It’s really TEN months. The betrayal!) parents dream of and imagine their new baby. Preparing their home and nursery, scouring the ultrasound pictures for WHAT their baby will look like, dreaming of all the things they will do with this kid. And many parents plan especially for the first few hours of the baby’s life. A mother may picture holding her baby for the first time, feeling it in her arms. She may look forward to seeing her newborn’s face and looking into her baby’s eyes for the first time. And with so much good evidence that immediate skin to skin after birth is beneficial, she wants to start her parenting journey just right. She wants uninterrupted time, with no distractions or separations. She wants this “Golden Hour” to be as perfect as possible. Sometimes, like life, birth doesn’t go as planned. For various reasons, the immediate postpartum time can be disrupted or disturbed. After all of this dreaming and expectation, it’s understandable when parents feel betrayed if their “Golden Hour” isn’t so golden. They may feel loss for their own experience or even a feeling of failure that they weren’t able to give that time to their baby. Parents can judge themselves harshly when that first hour doesn't go as planned. Sound sh*tty? So let’s get ready. Let’s have some #realtalk about what sorts of things can occur to disrupt the first hours with your baby, how you can minimize the risk and what you can do if it does happen. And THEN, let’s talk about how to OWN those first hours no matter what goes down in your labor. It wasn’t so long ago that babies were routinely taken from the mother just after the birth so that medical staff could care for each patient separately. We still have some holdovers of this style. A few hospitals will take the baby to the warming table to dry it off, administer newborn procedures, weigh it, measure it, etc. Then after all of the boxes are checked, they will present the diapered, swaddled baby to the mother. Buuuuut, the newest recommendations are for uninterrupted skin-to-skin time, for vaginal or cesarean delivery. If everyone is doing well and transitioning without a hitch, then baby goes to mother. This is a great conversation to have prenatally with your doctor or midwife. Ask if they ensure immediate skin-to-skin after the birth. And if it’s not routine, ask if there’s any reason why you can’t. One of the biggest change agents for hospitals is patient feedback and advocacy. If Routine Separation is…routine for your place of birth, you will need to remind your staff during the labor of your request. The best time to do so is during second stage, pushing. If mother and baby are healthy and normal, all newborn procedures can be delayed for that first hour. Occasionally the circumstances of the delivery change the plan. Even in hospitals, birth centers or home births that prioritize immediate skin to skin, safety always comes first. The baby may have passed meconium in utero, was in distress during delivery or is having some trouble transitioning. There are many ways to handle these scenarios, and your provider has their own protocol. OFTEN it means the baby goes to the warmer where staff, like a team of pediatricians, will work on helping your baby. Of course this is alarming for parents! It often isn’t an extended separation, but seeing your baby over at the warming table surrounded by several doctors is harrowing! Add to that the strange appearance of newborns, and it’s difficult for parents to know when to worry. Usually the staff will help prepare the parents for this possibility if they have an indication that it will be necessary. But sometimes it’s a surprise or an in-the-moment decision. If so, parents have some choices. The mother’s partner can ask her after the delivery, “Do you want me to stay with you or go with the baby?”. If mother is in need of partner’s support, they can each send their love and attention to their baby across the room. Mother can talk to her baby from the bed. Babies recognize their parents’ voices! If mother says to the partner, “GO BE WITH THAT BABY!”, she can still send her love and loving words to her child. Partner can give mother a play-by-play of what’s happening, something like, “They’re drying him off. He is looking at me. He has the longest fingernails and is so pink! He’s peeing.” Etc. This gives the mother those moments back. Once the medical hub-bub has quieted down, then partner can advocate to get the baby to mother as quickly as possible. Or sometimes parents will request that the nurse take care of all of the newborn procedures now so that they won’t be interrupted again. There’s still the business of the placenta. The third stage of labor (yes. LABOR) unfolds. And this is a high point of action and attention for your medical team. Someone will be attending to the placenta. Someone will be performing “fundal massage”, which is neither fun nor a massage. Sometimes the mother will need to assist in getting the placenta out by pushing. Then when all of that is stabilized, the care provider will check for any tears to the lady bits (perineum. taint.). If necessary, there will be stitches. So there’s lots of fussing and hands on deck (mother = deck). With all of this still going on, it’s a wonder that parents can focus at all on their little one. It may be more realistic to consider the “Golden Hour” the time after the ENTIRE labor is over, including the 3rd stage. For now, just holding the baby and letting it be comforted by your presence is beautiful parenting. The baby will also benefit if he/she is held by another person while mother gets through this last bit of her labor. There have been several studies showing that baby gets many benefits of skin-to-skin time with the father. 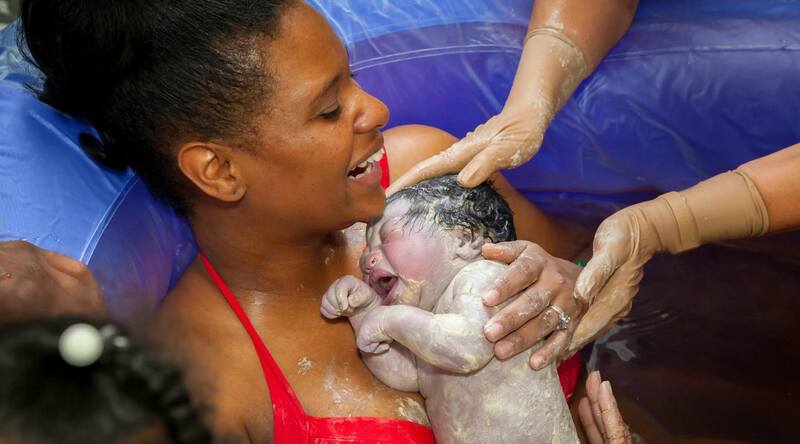 For a few mothers, the first moment after the baby is delivered is a moment of shock. She is between two worlds and may be somewhat frozen, psychologically. She may just need a minute. The hard physical, emotional and mental work of birth takes a toll. It is a BIG DEAL. It makes perfect sense that some of us don’t transition immediately to “all better! Love you, baby! Let’s eat a sandwich!”. If this happens, it is normal. Think of athletes who have just completed a race or breaking a record. Of course they are proud when it sinks in and they want to celebrate. But just before that? They are in-between. They are sitting between the boom and the echo. Mother can ask that they baby’s newborn procedures be done right away so that she can have a minute. She can ask her partner or other birth companion to hold the baby while she gathers herself or relaxes into the bed. She can hold the baby close but still focus on her own self-care. It is an eternal theme of parenting to find balance between self-care with care for your children. BOTH are crucial. And then sometimes the baby isn’t quite ready to gaze into your eyes, either. Sometimes they are fussy or stunned, as well. The “Golden Hour” is best when all parties are ready and on board. That may be hours later. With these possible scenarios, it is self-compassionate to plan for a delayed “first moment”. YOUR Golden hour may occur when everyone is ready and when you can bring your fullest self. Here's a quick video of the same idea! Maybe it’s after the fussing of medical protocol has dissipated. Maybe it’s when the nurses and doctors have left the room for the first time and it’s just the three of you. Or perhaps the next day, when you notice the baby is ready and awake, staring at you intently. Or for some, it even happens days later or after a NICU stay. The first night at home. The first time they smile. The point is, you can’t really lose this hour. But you can bring awareness so that you will discover when YOUR golden hour occurs. When you notice that you are having your first real focus-time, real Golden time with your baby, you can bring to this moment a ritual or a plan. Some of my clients have religious backgrounds that play in. Perhaps they say a prayer or a blessing for their baby. Maybe you would like to welcome your baby with a special song or prepared statement of love. For some, they want to wrap their baby in a baby-blanket that is just for them – maybe a family member made it out of love or it’s an heirloom. Some give their baby a gentle massage or blessing with oil. For some, it’s as simple as saying the baby’s name out loud or taking the first family picture! To create your own plan for YOUR “Golden Hour” with your baby, I’ve created a worksheet. You can fill one out and your partner can fill out a separate one, then you can come together to create the just-right ritual for welcoming YOUR baby here. Remember, too, that parenting is a long game. After months or even years of loving and caring for your child, you will have a million moments of doing it best. And some moments of doing it all wrong. Your parenting isn’t just one moment or hour. It’s the sum-total. You will have MANY Golden Hours.